The Hydrangea is probably my most favorite flower. I can't grow these in our dry, desert soil so whenever I am traveling and see them I love to photograph them. the hydrangea starts to show its colors of Autumn. I can't resist a few macros to see the detail in the petals. and how the color of the hydrangea changes with the type of soil it's in. Now, even as Autumn is upon us, the hydrangea continues to show it's beauty of the season. It's cloudy, rainy and cool here in Las Vegas today. Thank you for all of your lovely comments. I love these - so beautiful. I love Hydrangea, amazing flowers! I love Hydrangeas too. I can grow them okay, but I think it gets a little too cold in the winter and I have them planted in an area that is a little too wet. I love your pictures. I always have to stop and look twice to make sure I spell hydrangea right... did I? hee hee.. love their mellow color. you really captured the textured moody beauty of the blooms!! Such beautiful flowers.. You have captured them perfectly my friend.. I have had the doors open all day just taking in all this wonderful weather.. I bet you are too.. They are a beautiful flower. They make me think of the east coast which is where I was born. One of my absolute favorites, so beautifully captured Becca! The range of color in those petals is awesome! You don't realize this until you look at them close up like that. 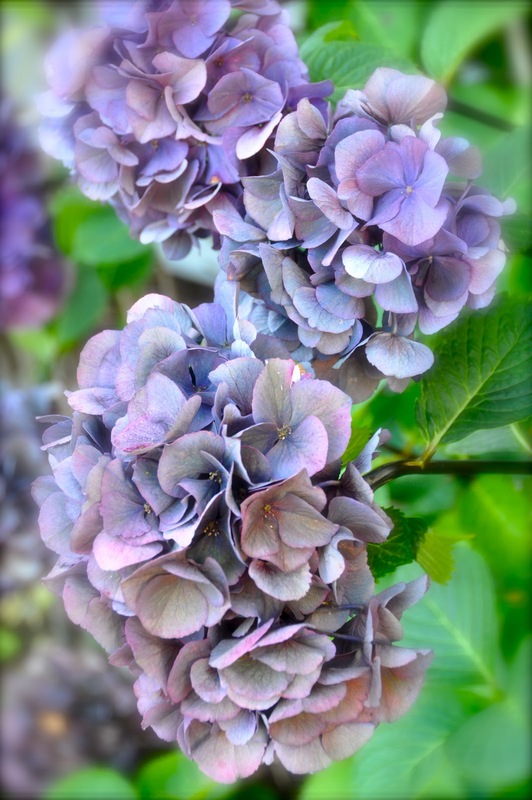 Beautiful pictures of Hydrangea. Soft and lovely color. I love these old fashion flowers also. It's always good to find another person who is fond of Hydrangeas. Your shots are lovely, and so detailed. Now my potting bench is covered in turquoise and lime blossoms. Because this being the West Coast, we grow em big. All that rain has to have some good returns. Lovely shots of hydrangea. They have such personality and all their blooming phases are beautiful. I love this flower too Becca! I used to have so many different types in my gardens. One day i will have a garden filled with them and you will too!! I just know it!!! I love these, Becca! Hydrangeas are fabulous and fascinating as they change color. I dry quite a few every year for inside the house. oh my, the hydrangea IS my favorite flower. over here, we can buy a pot with some blooms but that's it. it won't bloom again. i was recently in Spain and i saw a whole garden filled with them! like you, i took a lot of photos too! beautiful, I love your photos of the hydrangea, amazing, stunning. Def my favorite flower! I just cant get enough of it. My daughter chose it as the flower to use in her wedding and it was over the top. I just purchased a new camera and cant wait for mine to bloom. Hopefully I will know how to use my camera by then! Great photos and happy PPF!